Archos' G9 Android Tablets Have Superfast Processors and... Hard Drives? 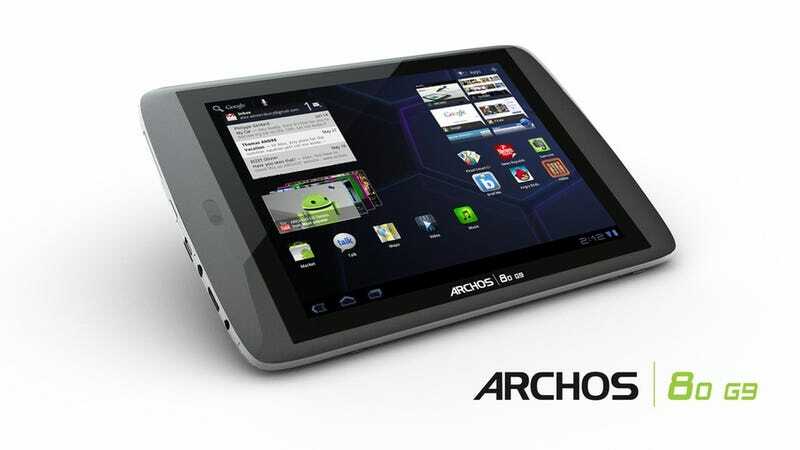 Archos Android tablets. Typically considered also-rans, but these things do have a 1.5GHz dual-core processor and up to 250GB harddrives. The 10-inch G9 "Turbo" is packing Texas Instruments 1.5 GHz dual-core OMAP 4 processor, and Archos claims that will make page loading 50 percent faster than competitors tablets (which typically run 1GHz dual-core Nvidia processors). I cannot wait to find out if that's actually true. The 8-inch model also use a dual-core TI OMAP 4, but it will only be clocked to 1GHz. The biggest point of differentiation is that these guys have the option of gargantuan 250GB harddrives from Seagate. While that's eight times more storage than the more common 32GB tabs, something important to keep in mind is that this isn't SSD, it's a regular old spinning harddrive. Spinning harddrives are bigger, heavier, more fragile, and way more energy-hungry. Not only that, they're slower. Will the spinning harddrive totally hamstring the superfast processor? (To be clear, both tablets come standard with 16GB of flash memory. These larger options are optional with additional cost.) Archos claims that these Seagate drives' special "4GB flash caching system" will make it just as fast as flash. Right. They also note that these drives will spin up only when in use, so it's likely that these tablets contain enough flash storage to run the OS and probably all of your apps, and the 250GB would just be used for storing media. The G9 80 has an 8-inch, 1024 x 768 4:3 screen, similar to the iPad, aiming more at e-book readers. The G9 101 has a 10.1-inch, 1280 x 800 16:10 screen, similar to other widescreen Android tablets, emphasizing video and multimedia. Both tablets have enhanced video players (more codecs for you sneaky torrenters) and HDMI out, and you should be able to cram 50 hours of 1080p video onto those harddrives. They're both Wi-Fi but they have full-sized USB ports (which I love), so you may be able to attach a wireless dongle, maybe. They both run Android 3.2 Honeycomb without any kind of skin. These suckers are starting at $299 for the eight-incher and $399 for the tenner. Options are the 16GB solid state vs. the 250GB HD, and you can chose to upgrade to a 1.5GHz processor in the 8-inch model, too (see price breakdown below). My biggest reservation is the spinning harddrive they've put in these things. While that kind of capacity is neat, do we really need it in a tablet? Further, tablets are portable devices and most standard harddrives don't like to be moved while they're spinning, plus there's heat and energy consumption to think about. Regardless, I like seeing manufacturers differentiating themselves by their hardware, and not by putting a crappy overlay over Android. They will both be available in late September.